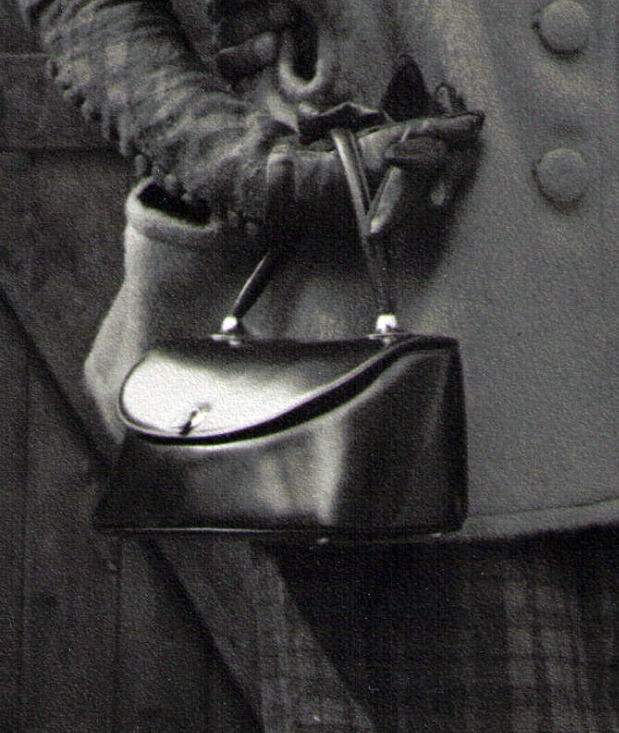 I remember well this handbag my mother is carrying. Visit Mom’s Closet for the story. 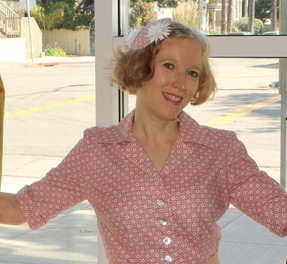 Shirtwaist dress with matching fascinator. I’ve been hit with Fascinator Fever … ever since I saw Kate’s feather fascinator back in March. What’s a girl to do? Make one for herself. At Lacis in Berkeley, I purchased a small round form. I had no idea what I was going to do with it, but over time and pondering I decided to cover the form with extra fabric from my custom-made shirtwaist dress. I simply cut out a round swatch and handsewed it to the form. Initially I was going to embellish it with a bow of the same material, but my mother suggested white flower clips instead. (She even bought them for me. Thanks Mom!) They are embellishment enough and secure the form to my hair. I wore it for the first time the other day and wow, it’s really comfortable. 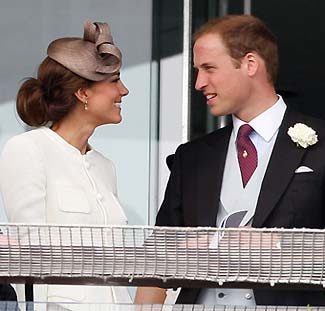 I know why Kate favors fascinators – no fuss. Not like a hat, which can be troublesome in the wind, flatten hair, and/or cause a headache. How about you? Do you have Fascinator Fever? Leave a comment and do tell. Paper birds by Aimee Baldwin. In the last few years I have become fond of birds. I live in front of a hill full of springtime birds and what a treat it is to awake in the mornings listening to their melodious chatter. Last year when a set of wrens built a nest on my patio, I was forever perched at the window watching a family of four baby birds hatch, grow, and finally (sadly) fly away. So, I was very excited when I found Berkeley artist Aimee Baldwin and her paper birds. Aimee creates all kinds of birds and their environs from a special crepe paper imported from Germany. She started her craft by making flowers with the paper and soon realized that its pliable quality would work well for birds. Since 2006 she’s been sculpting and showing her feathered friends at various fairs and galleries around the Bay Area. Aimee refers to her art as Vegan Taxidermy and says she’s inspired by her affection for nature and concern about habitat conservation. 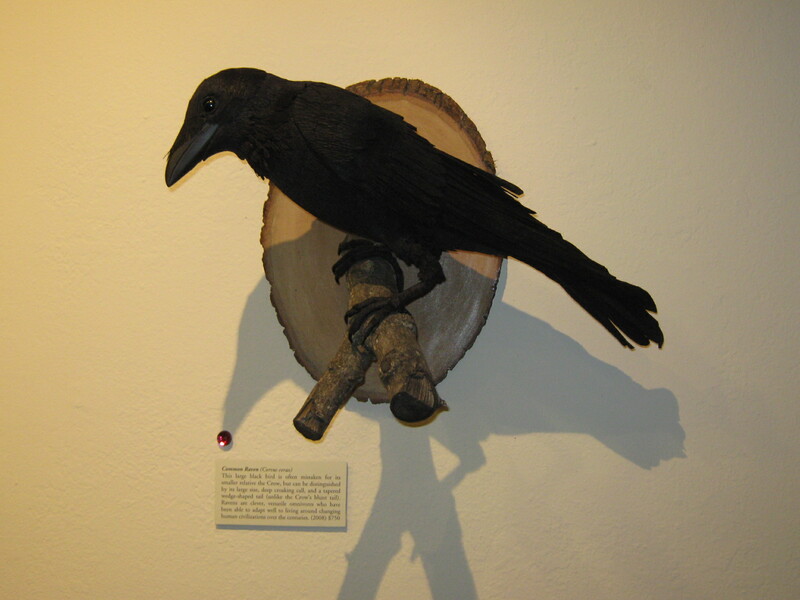 Aimee’s entire bird collection is now on display at Castle in the Air in Berkeley. Included are owls, parakeets, hummingbirds, and more. Each is handcrafted without animal products and takes a week or so to complete. In addition to the crepe paper she uses salvaged white pellet foam, wire, acrylic paint, and glass. Paper Birds by Aimee Baldwin at Castle in the Air now through July 15th, 1805 4th Street, Berkeley. Many are for sale and the best part? They’re guaranteed not to fly the coop. Mom, her stepfather, and her mother. Harrow, England, 1964. 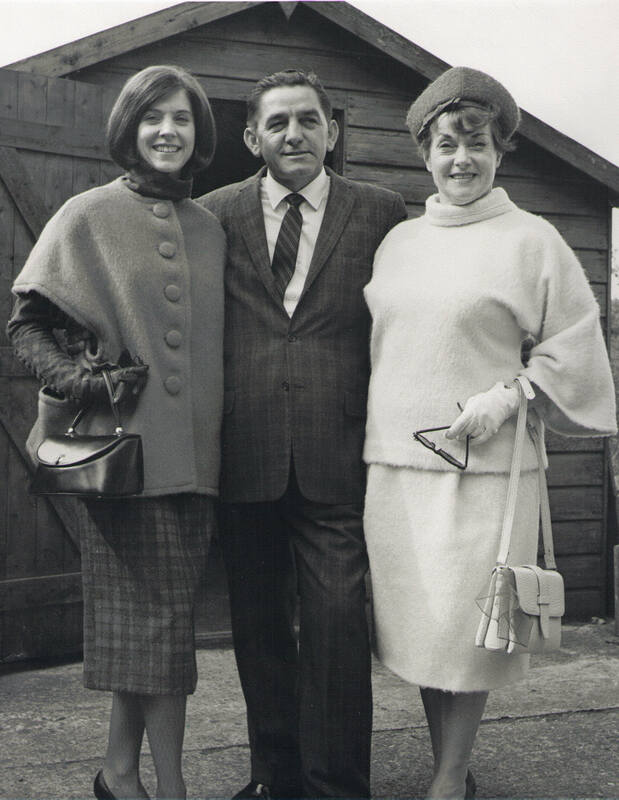 I was sorting through family photos and found this one of my mother, her stepfather and her mother. My grandmother designed the outfit Mom is wearing. Read the story behind the outfit in Mom’s Closet – Family Affair. Vanessa Getty at the Swarovski opening reception in San Francisco. Photo: Drew Altizer. San Francisco socialite, Vanessa Getty hosted an evening of sparkle recently at the opening reception for the new Swarovski shop in Union Square. In addition to being a local style maven, Ms. Getty is a tireless fundraiser for animal welfare, a noble pursuit supported by the Swarkovski company. Known for innovation in crystal cutting technology, Swarovski gave costume jewelry a little glamour for everyday women back in the late 1800s. In the 1930s, fashion designers such as Chanel, Balenciaga, and Schiaparelli all incorporated Swarovski crystals in their creations. By the 1950s, Hollywood caught on with costumers adding crystals to their designs and actresses sporting Swarovski jewelry to opening nights. 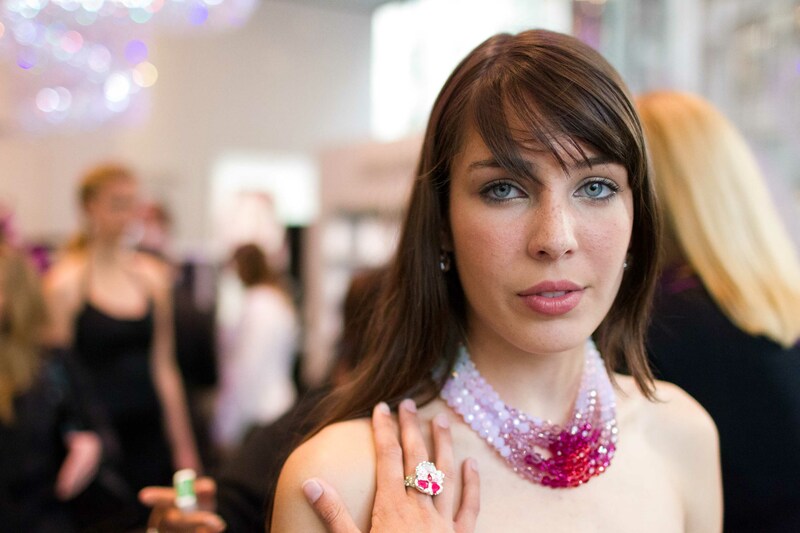 Swarvoski crystal jewelry. Photo: Drew Altizer. Today Swarvoski is still a family owned business based in Austria and also a growing brand name with shops all around the world – three in San Francisco. In addition to jewelry and beads for fashions, they make animal figurines and home decor items. Swarovski Crystals remain a hit with designers – Armani, Prada, Alexander McQueen, Gucci are just a few who regularly use the sparkle stones in their designs. My own experience with Swarovski dates back to the early 90s on a European tour. While in Austria, I picked up a Swarovski memento for my sister-in-law, Lori, in the form of a crystal fish. Swarovski animal figurines were and still are quite collectible. I fell in love with the little fish for its faceted body and twisted frosted glass tail. What made it a perfect gift for Lori is that she’s a Pisces. The new Swarovski shop is located at 295 Geary Street in downtown San Francisco. Catherine with an updo and William in tails. Courtesy of Getty Images. I have been champing at the bit waiting for Catherine, Duchess of Cambridge to sport an updo. Finally, at the Epsom Derby this past Saturday the Duchess pulled back her (too) long hair into a chic chignon. Since wind is ever-present at royal events, I have wondered why Catherine hasn’t just pulled her hair up. Beyond that, I knew an updo would be a good look for her and hey, I was right. Catherine was pure elegance dressed in a cream springtime suit. She strolled in taupe pumps and carried a matching clutch. A taupe woven fascinator with a curlycue on top added a bit of whimsy. 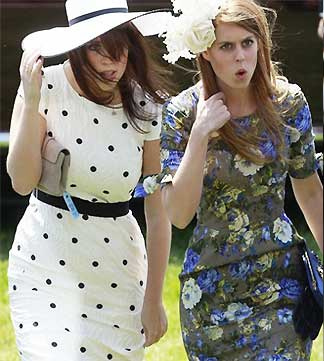 In complete contrast to Catherine are Princesses Eugenie and Beatrice. Courtesy of Getty Images. The boys were dashing in top hats and tails and the Queen was pouty in pink after her colt came in third. Just goes to show, not even royalty get everything they want. Ladies, the cry has been answered with – FlairWalk – a new online boutique for women. Launched in May, FlairWalk offers clothing, accessories, and gift items handpicked by proprietor Sara Weinstein. Sara knows a lot about wholesale and retail business. For 15 years she represented some of the nation’s leading specialty educational toy companies, a position that provided the flexibility she desired to raise her son. Now with Zach off to college in Los Angeles, Sara felt it was time to start her own business. Sara Weinstein, proprietor of FlairWalk. Photo by Horace Long Photography. Sara, what inspired you to start your own business in fashion? I have always wanted to have my own business but decided to wait until my son was in college. Running a business is very time-consuming and I didn’t want it to interfere with any important mom things. I chose fashion because, quite simply – fashion is a passion of mine, and I really enjoy color and design. You have handpicked 16 designers from around the world to feature on FlairWalk, how did you find them? I started with designers that I own myself and have found fashionable, comfortable and versatile, such as Trina Turk, Desigual and Sobral. I often receive compliments from friends and strangers alike when I wear these lines. My personal style is classic with some edge (or “va voom”) to it. I try to buy pieces that take little effort and pair them with other pieces to make a fantastic looking outfit! I also try to buy things that can be dressed up or down, for example a dress that can be worn with a flat black sandal for a more casual look with minimal makeup or worn with a high heel sandal with more makeup for a dressy, dramatic look. What qualities do you look for in a designer for FlairWalk? I look for designers who offer quality in design and craftmanship as well as color choice, appropriate fit, versatility of garment, my perceived desirability to women and if I think it will look good on a variety of women (short, tall, blond, brunette, slim, medium build, etc.). You have a section called FlairPick where you feature a “real” woman modeling some of your merchandise. What’s the thought behind that? When I was coming up for the idea for the site, I thought of using “real women” for the FlairPick section because I think society puts so much pressure on women to look a certain way – mostly tall, thin and young – and that is unrealistic for most women. By using real women FlairWalk is highlighting the fact that all women can look great just the way they individually are. How does FlairWalk differ from other online women’s boutiques? FlairWalk keeps in mind how busy women are these days, working or non-working, with children or without. We offer clothing, accessories and small gifts that are very easy, and make women’s lives simpler. When you say easy, what do you mean? By “easy” I mean that one can put it on and look great! It doesn’t take a lot of time to figure out what looks good with it. Also “easy” is that the piece of clothing that will go with different items, such as work pants or jeans, and be part of different outfits. Speaking of easy, not only is the website easy to negotiate but it’s very friendly, like a personal shopper or a shopping buddy. Do you envision FlairWalk this way? Oh good, I’m happy to hear you say that. Yes, it was one of the goals when creating the website that it had a warm and friendly feel. Thank you, Sara. Best of luck and I’ll be back in touch for FlairWalk updates.